Sameer Sattar is the founder of Sattar&Co. Barrister Sattar has substantial professional expertise in commercial, corporate and dispute resolution matters. He is qualified as an Advocate in Bangladesh and has been called to the Bar of England and Wales. 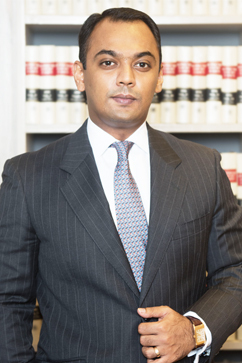 Sameer Sattar is a Barrister with specific interest in commercial transactions and dispute resolution matters. In Bangladesh, Barrister Sattar’s practice primarily involves corporate and commercial advisory work and litigation. This includes, inter alia, acquisition of private companies and banks, setting up limited companies in Bangladesh, advising foreign companies on joint ventures and other commercial issues, loan syndication for projects and drafting commercial documentation generally. Barrister Sattar’s practice in London (at Debevoise & Plimpton and, later at, Volterra Fietta) focused on international arbitration. He has worked on and appeared as counsel in several international arbitration held under the auspices of the ICC, UNCITRAL, LCIA, SIAC and ICSID rules. He has extensive experience both in commercial and investment treaty arbitration. As a Barrister, Mr. Sattar conducts his own advocacy. He has appeared as an advocate before numerous arbitral tribunals and before the Courts in Bangladesh. Barrister Sattar has particular expertise in public international law and has acted in disputes involving States and State entities. He has advised various multinational companies in relation to their rights under international law. Barrister Sattar has worked on arbitration conducted in all major venues around the world arising out of a broad range of transactions including foreign investment, public concessions, energy, natural resources, mining and exploration, banking and financial services, international trade, construction and shareholder disputes. Barrister Sattar is ranked in Band 1 by Chambers & Partners: Asia Pacific (2017) and is also recommended by The Legal 500. He is also an advocate of the Bangladesh Supreme Court and is a well-known dispute resolution and litigation expert. Apart from his legal expertise and skills, Mr. Sattar was also nominated and chosen by the US government and the European Union for their Leadership Visiting Programmes and was director of the Dhaka Chamber of Commerce, responsible for foreign direct investment. Barrister Sattar is the author of many publications on international arbitration; see Publications. Advised the Bangladeshi Privatisation Commission in relation to the proposed sale of a State-owned bank involving $Ms. Advised the Bangladeshi Seller in relation to the acquisition of shares in a local telecommunications company by a Japanese Buyer involving $Ms. Advised a leading foreign pharmaceutical company in relation to their divestment and management sale in Bangladesh involving $Ms. Advised a German financial institution on loan syndication projects in Bangladesh. Advised a leading telecommunications company on its loan syndication project in Bangladesh and other telecom matters. Advised foreign companies in setting up joint venture companies for various projects in Bangladesh. Advised a mobile phone manufacturing company based in Singapore to set up operations in Bangladesh. Advised a semi-State entity in relation to the sale of exclusive marketing agency rights to a foreign company for $Ms for the broadcasting of international cricket matches. Advised a foreign company, in relation to a concession agreement, regarding the construction of a 7km fly-over in Bangladesh. Advised a leading foreign company in relation to their turn-key contract/project for setting up telecommunication network facilities in Bangladesh. Represented a major Turkish construction company in an ICSID arbitration against the Government of Turkmenistan. The client undertook numerous high-value construction projects which have been cancelled by the State. Represented one of the largest private companies in the world (US based) in an ICSID arbitration against the Government of Venezuela whose investments in a fertilizer company have been expropriated through changes in law and a formal expropriation. Defended a private equity firm in a LCIA commercial arbitration brought against it by a partner. The dispute involved the unlawful termination of a partnership agreement. Represented an Eastern-European State in an investment treaty arbitration under the UNCITRAL Rules. The dispute involved allegations of expropriation of a shipping construction programme by the actions of a State entity attributable to the State. Represented a South-Asian State in an investment treaty arbitration under the rules of ICSID. The dispute involved allegations of expropriation of a financial contract by State organs. Represented the Government of Bangladesh in an investment treaty arbitration under ICSID rules in a dispute involving indirect expropriation of an ICC arbitral award by the national courts. Represented a Bangladeshi State entity in an international commercial arbitration held under the ICC rules involving a complex dispute regarding the construction of a dam. Advised a multinational company in relation to economic sanctions. Advised a foreign investor in relation to its legal rights under a concession contract containing an ICSID clause. The concession contract has been annulled by the new Government after coming into power recently. Advised a foreign pre-shipment inspection company in relation to its rights under international law and a bilateral investment treaty with respect to an unlawful termination of a PSI contract. Represented companies in domestic commercial arbitration held under the Arbitration Act 2001 of Bangladesh. Most disputes related primarily to breach of commercial contracts and the compensation due. Represented companies in the Bangladeshi courts for and against banks in relation to debt recovery claims, matters relating to fraud, disputes relating to share buy-back agreements. Trained government officers in a Middle Eastern State on issues of dispute resolution and arbitration. Delivered a joint lecture at Kings College London on Evidence and Weighting in International Boundary Adjudication.